Although many people are fleeing Syria for the safety of Europe there are still thousands of internally displaced people inside the country. 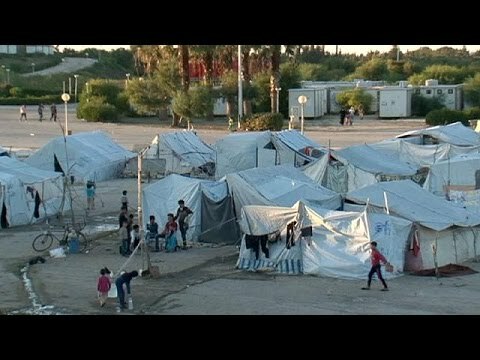 Euronews was one of a number of media organisations shown round a camp in Syria as part of a facility organised by the Russian and Syrian governments. One camp in Latakia on the Mediterranean coast houses more than five thousand people, half of them children. The authorities say that more displaced people are arriving every day from neighbouring provinces. For some families the camp has become their permanent home. School facilities are provided and there are some work opportunities for adults. Most people have arrived from neighbouring provinces where Syrian opposition rebels have seized power. The Russian Defence Ministry has released footage to the media of what it says are airstrikes on ISIL positions in Idlib and Raqqa. The release of the video coincided with a pro-Russia rally was organised by authorities in the port city of Tartus, where Russia has had a naval base since 1971. Many of those attending were students and some had studied in Russia. Some of the demonstraters carried posters of Vladimir Putin and Syrian President Bashar al-Assad.